Training the eye to find key trend lines is just one expertise a pro trader must learn on their way to profitability. In fact, it may just be the most important piece to the puzzle yet the most underutilized and unknown. Trend line analysis is something that not many individuals learn because it takes time and we are a culture of instant satisfaction. As we all know, may traders, investors, funds all focus on fundamentals. In addition, most other traders, investors, funds, if they use technical analysis, focus purely on the common technicals like the moving averages, Stochastics, MACD, RSI and others. These are commonly used by every technical trader in the world. They all use past data to project future results. The market is a funny entity in many ways. It generally finds the majority and decides to go the opposite way. This can be seen with the put/call ratio and all other sentiment indicators. To summarize, when everyone is jumping off the cliff in panic, the market is usually ready to reverse and when everyone is putting their equity from their house into the market for “easy money”, the market has topped and will drop dramatically. This can be seen just by looking at the last 2 years in the stock market or in the housing market. It also can be seen last November, when the lows were hit and the DOW had 500 point intra day swings like it was a giant brushing off a fly. The panic was in the market in November, and at those lows the VIX (fear index) saw unheard of numbers over 80. The normal range for the VIX previously had been 10-40. At 40, the market had previously hit the highest fear level. So obviously, at 80, it was all out panic and thus a major buying opportunity for a month or two rally. My point is this. Trend line analysis is a little known art. It is something that takes years to train the eye to see easily. However, once completed and trained, it opens a whole new world. As I have continued to master the markets as part of InTheMoneyStocks.com, I have continued to train my eye to spot these trend lines. By purely focusing on price, pattern and time we have eliminated all the nonsense every other trader is looking at. Just like the VIX and other psychological indicators show us the emotion in the market and the right move is almost always the opposite, the same applies to technical indicators. When a majority of the traders, investors, funds use certain technical indicators, they stop working. At first, as they begin to get more popular they still work a majority of the time, as they get more and more popular however, they work less and less. Why? Because in the market there is always a winner and loser and emotion rules. The more people that try and go short at the resistance level on a moving average, the less likely it will work due to basic laws. Remember, go the opposite of the crowd. I never trade off a Stochastic, RSI, MACD or any other technical indicator other than to look for divergences occasionally. Price, pattern and time are my Bible, Torah or Koran. Trend line analysis is not something easy and that is why people do not learn it. Traders are just like majority this world. They are naturally lazy and want everything instantly and to profit immediately. That is why the basic technical indicators are loved. Computers can program them in, no work for the individual and they pop up on the chart. Those are the traders that will ultimately lose or never get to the elite trader status. Work hard, educate yourself and spend time truly learning pattern, pricing and time values and the profits will come. The best example I can give is the chart below of Goldman Sachs. What Goldman Sachs shows is repeated on hundreds of charts every day. It is common and it is using the “normal” technical trader to coax them in a short trade and stop them out. About 1 out of every 100 trader knows how to use trend lines properly. 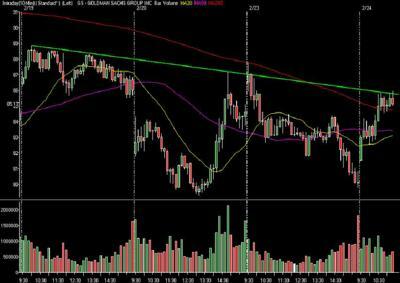 Have you ever been in a trade where you shorted up against a major moving average, the stock continued higher, you got stopped out and then just a little while later the stock rolled over. Then, you kick yourself for not holding longer? This chart below explains why? Note in the chart below. There is the major 200 moving average coming into play on the upside as Goldman Sachs screams higher. As Goldman hits the 200 moving average, most traders take their short positions. This is where the mistake is made. Note the trend line drawn in just above, which is clear as day and stretches back 3 days. This is the true level Goldman Sachs will see and those few that know trend line analysis will be ready. The “normal/average” trader, after shorting at the 200 moving average, is beginning to feel the pain as Goldman pushes higher. Goldman Sachs spikes over the 200 moving average by a full dollar at which point those who shorted at the 200 moving average would cover their position. Little do these traders know, Goldman Sachs just hit a key resistance level as shown on the chart below. Those pro and elite traders that know trend line analysis will have waited patiently as every other trader shorts the 200 moving average. As Goldman Sachs hits the trend line, the elite traders short. Goldman Sachs falls from that trend line resistance point and profits are made for the elite. Learn your trend line analysis. The profits will finally start and grow. Hi. Great article and totally agreed upon. I like to share my work. I use trendline analysis purely and have a unique technique to intercept the market. Is there a way to get in touch with the author and let him see my way of plotting trendlines. I have self learned the art and I don't go by the books. However; it may sound like a big statement but my way of plotting will out do any other form on any pair at any given time. I chart indices like SPX / Comm like GOLD / OIL and FX. My strength is finding bonafide supp/resis, channels (bull / bear), patterns (existing within the current PA and or possibly coming into play hence catching them b4 they even actually form out), breakouts and as such. I don't use any sort of avg bases tools just plain simple trendlines on candle stick formation.